Ralph Melville, the founder, builder and operator of the Mountain Chalet, first came to Aspen in 1951. He found the town overbuilt from the 1950 FIS races. He returned in 1953 and broke his ankle skiing. He considers this his lucky break because he found himself stuck here with nothing to do but wander around and look at real estate. With real estate agent Jim Moore, Ralph looked at the lot where the St. Regis now sits. It was seven lots and was initially offered at $4000, which was too much. They came back asking $4500 and Ralph felt that was really overpriced. As an alternative, Mrs. Salisbury owned two lots (1200 square feet) on the corner of Mill and Durant. Ralph bought this property for $2000 in February 1953. He began building in August 1954 and was ready to open at Christmas-time with three usable rooms: 2 bunk rooms (each with 4 beds) and one room with two twin beds. Over the winter he finished six more rooms. In 1957 he bought Billy Zaugg’s two lots from Mrs. Towne, and bought Mrs. Swearringen’s lot after she died in 1963 or 1964. In the spring of 1956 Ralph began two floors of the east wing, at the same time he built Ed’s Beds and a house for Madge Soderstrom. He had three guys working with him. This east wing section was finished in the winter. Ralph made $1900 the winter of 1954-55 and lost it all the summer of 1955 trying to run it as a regular lodge. So in the summer of 1956 Ralph started providing housing for music students in town for the Music Associates of Aspen. They leased the whole lodge for 9 weeks. This continued every summer until the Marolt Housing was built. With these low-maintenance guests at the lodge, Ralph would do other projects. Some years they would go to New Mexico to work on the railroad, or sometimes there were houses to build for people around Aspen. Marian met Ralph in June 1956. She had come to Aspen in 1955 with Dottie Keleher whom she had met at Mont Tremblant, Canada in 1954; they were in the same American Youth Hostel group with Charlie Patterson. She spent her first winter in Aspen skiing and working at the Holland House and the Sundeck. Marian and Ralph first met formally at a picnic at Chapman Dam up the Frying Pan River valley. She and her then-boyfriend caught a ride back to Aspen with Ralph, but the boyfriend had so much to drink he fell asleep on the trip. With the boyfriend out of the picutre their relationship moved quickly. 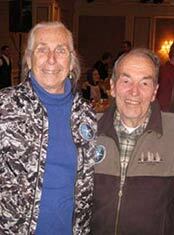 They were engaged in July and set a wedding date of August 18, 1956. On August 5, 1956, just before they were to be married, Ralph was climbing North Maroon Peak of the Maroon Bells when he fell quite a distance. (His ropes were in his backpack!) It was a very serious fall: He broke his right knee and tore all its tendons and ligaments, displaced the kneecap to about 8 inches up the leg, broke the left arm, and four ribs, cracked three or four vertebrae, plus the jaw was broken and dislocated. In addition there were multiple cuts and bruises on his head and his left eyeball was totally reddened. The fall necessitated a full-length leg cast. Also his jaw was left dislocated and unwired because he couldn’t move it. Marian, already in Philadelphia and Pittsburgh to prepare for the wedding, heard this and came back to Colorado to help Ralph. They released him from the hospital to her care, and they went straight to the lodge, got his suitcase, and left for the wedding. She came home from the wedding to find out what life with Ralph would be like when she found the bedroom was the boiler room. Eventually, after trying a house off premises when Julie was a baby, the family moved into guest rooms at the hotel. At the peak family size, with seven children at home, the Melvilles resided in what are now apartments 130 and 230. Maroon Bells. 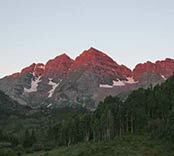 North Maroon Peak is the center peak.